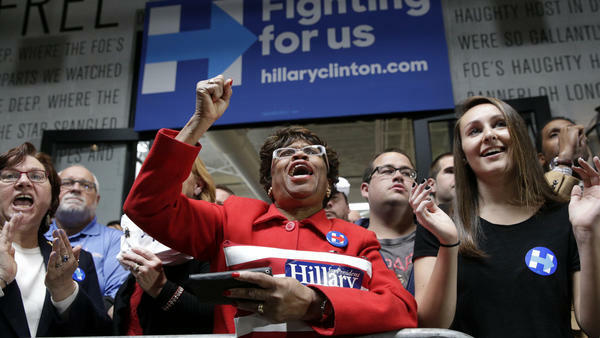 Supporters of Democratic presidential candidate Hillary Clinton cheer during a speech by the candidate last week in Baltimore. In most states where exit polling is available, men have voted for Hillary Clinton at about the same rate as Bernie Sanders. States where Clinton won the overall vote are bolded. Women, of course, like any demographic, are not a monolith. Hillary Clinton consistently loses young women (ages 18 to 29) to Bernie Sanders. But, accounting for women of all different groups, Clinton has a clear advantage. There are a few exceptions: New Hampshire — where Sanders dominated essentially every demographic; Vermont — Sanders' home turf, where he won women by more than 60 points; and Wisconsin — where Sanders and Clinton essentially broke even with women. There could be more exceptions as the primary season continues, but, for now, exit-poll analyses suggest Clinton has a safety net, and it's essentially a web of women. 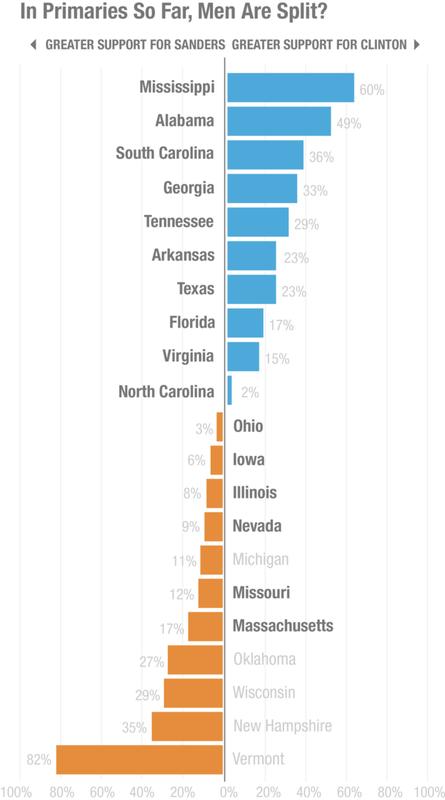 NPR interviewed dozens of women in different states about Clinton. Some said they identify with her, because she's a woman. Others said they support the former secretary of state because of her experience and intelligence. But almost everyone at some point in the conversation, whether or not they were committed to voting for Clinton, mentioned they like her, because she understands "women's issues." This term — "women's issues" is vague and has a different definition depending on who's using it. For Angel Suit, a single mom in South Carolina who gets up before dawn to deliver newspapers for minimum wage, women's issues revolve around the economy. "We need better-paying jobs," she said, as she tried to quiet her 1-year-old son. "That's one of my biggest issues, especially the minimum wage in South Carolina." Other women pointed to equal pay and paid family leave. "Women are interested in kitchen-table issues — jobs, retirement, education, health — all the things that we need to do to raise a family and take care of elders," said Mary Metz, a retired professor, as she was about to enter a Clinton event on the campus of the University of Wisconsin-Madison. Metz said women like herself have complex concerns — both domestic and international. "[Women] are also interested in foreign relations, but they're interested in not having a lot of wars, trying to work things out," she explained. Why do women like Clinton? For some women, the allure of voting for Clinton is a matter of simple identity politics. "I identify with her immensely; you know, she's a woman; I'm a woman," said Chantel Moses, an entrepreneur in New York. "There's a lot of tasks that's associated with being a woman — multi-tasking, making sure that you're not only able to have a career, but also to provide for your family." Moses wants a woman lead the country, but she also wants to ensure a "competent" woman is in charge, she explained. Most women NPR interviewed insist they're supporting Clinton for multiple reasons beyond identity politics. "My choice of candidates on the Democratic Party is less to do with my gender and her gender and more to do with the politics," Liz Yuhas, 27, said. But, Yuhas, like many women, admitted that electing the first woman president is in the back of her mind, even if it's not the determining factor. For some older voters, gender is more central. "Look at the assault on reproductive rights," said Mary Strickland, 61, a Clinton supporter who works in investments. She added, "Some of the issues we fought for many years are being eroded. ... I work in a very non-traditional field. And, I do feel that women carry the water for women's issues whether it be reproductive rights, whether it be employment programs for women, whether it be daycare funding. ... We should have daycare provided for families throughout the United States." Clinton plays the "gender card"
In her 2008 campaign, Clinton struggled to talk about gender. Some critics claimed she "ran as a man." But, in the 2016 campaign, she often discusses women on the stump, as she did Tuesday on a panel about pay equity organized by Glassdoor, a company that collects data on employee salaries. "Now, occasionally when I give a speech like this, which I do practically every day," Clinton said, "people will say, 'Oh there she goes, she's playing the gender card.' And what I say to that is if talking about equal pay and paid leave and more opportunities for women and girls is playing the gender card, then deal me in." But, Democratic pollster Anna Greenberg said there's another group of highly coveted women — independents, who do not identify with either major political party. "Independent women tend to be one of the most important, persuadable blocs in the electorate," Greenberg said. "They sort of are the holy grail of general elections. ... They also tend to be a little more socially liberal and a little more economically conservative." And socially liberal women tend to have more liberal attitudes about abortion — an issue that's come to the forefront recently in the GOP campaign because of comments from Donald Trump. "The reason we have trouble talking to women voters is that many women voters believe Republican voters are wrong on specific women's reproductive issues — and that's a challenge," said Republican strategist Lisa Camooso Miller. "I think now more than ever the Republican Party is in a deficit because of the words and the actions Donald Trump has taken in the primary." But, it's not just words, it's also tone, continued Camooso-Miller. "That back and forth between the candidates," she said, "whether it's Donald Trump or anyone else, is really unattractive and unappealing to women, because we are looking for ... candidates that are coming up with solutions, talking about the issues rather than sparring with one another back-and-forth, sometimes even to the detriment of the other candidates' spouses." She said most voters — women or men — are concerned about homeland security and the economy, and Republican candidates need to figure out a way to pivot back to that conversation. Polls show Donald Trump has a 70 percent unfavorable rating among women. And, Camooso Miller is worried Trump is repelling women at the same time Clinton is trying to court them. If the current trajectory continues, Clinton could turn the traditional gender gap into a gender gulf in November. But, of course, she has to secure the Democratic nomination first. And, for now, she has a challenge — the other end of the gender spectrum — men. Exit polls show Clinton has had a rockier record winning male voters, especially white men. In Wisconsin, for example, Sanders won men resoundingly beating Clinton by about 30 points.